Lucene Revolution 2012 is now done, and the talk Robert and I gave went well! We showed how we are using automata (FSAs and FSTs) to make great improvements throughout Lucene. You can view the slides here. This was the first time I used Google Docs exclusively for a talk, and I was impressed! The real-time collaboration was awesome: we each could see the edits the other was doing, live. You never have to "save" your document: instead, every time you make a change, the document is saved to a new revision and you can then use infinite undo, or step back through all revisions, to go back. Finally, Google Docs covers the whole life-cycle of your talk: editing/iterating, presenting (it presents in full-screen just fine, but does require an internet connection; I exported to PDF ahead of time as a backup) and, finally, sharing with the rest of the world! Hey Mike, I'm learning a ton from your blog. 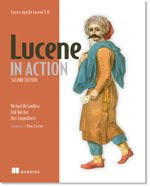 I thought I'd let you know I posted a Lucene FSA Tutorial on our company's blog that your readers might be interested in. Hi Doug, that's a nice tutorial! Thanks for sharing. Hi Mike, I know it is old article, but I have this question. When you say FST, do you mean Block trees(burst tree DS) terms dictionary in lucene code?